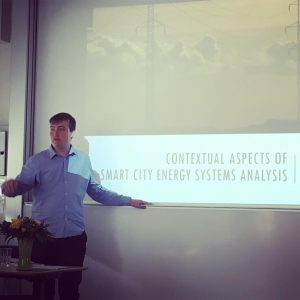 Wednesday June 14th, Jakob Zinck Thellufsen successfully defended his PhD thesis “Contextual Aspects of Smart City Energy Systems Analysis”. He is the first PhD to finish in the CITIES research project. Jakob Zinck Thellufsen has written a coherent thesis, which documents relevant and well-structured research, different analyses to explore a number of Interlinked and Important research problems using and developing partially new methodological approaches. The committee therefore concludes that the Ph.D. fulfils all the requirements for the Ph.D. degree.